There are only 48 hours left of Sale-a-bration! Did you pick out all of the free gifts that you wanted? Now is your last chance! Click here for the Quick Sale-a-bration Gift Guide to see all of your choices. Then visit my Online Store to place your order and choose one free gift for every $50 in your order, including products from the Weekly Deals page and Clearance Rack!! Looking back over my last three months of posts, I decided to share my top 8 favorite Sale-a-bration projects to share with you again. (I couldn't decide on five, so you get eight today!) Click here to ALL of my Sale-a-bration 2014 blog posts. 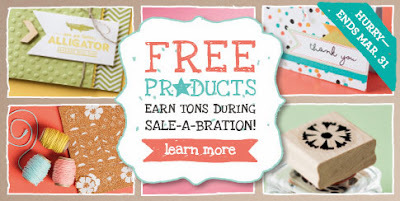 Labels: #saleabration, #stampinup, promotions, Stampin' Up! Spring Into Stamping with Me in April! Weekly Deals + New Stamps! Video Tip: How to Make Clear Mount Stamps STICK! 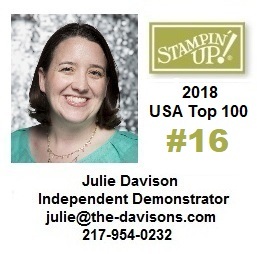 Attend Stampin' Up! Convention for FREE! !